Osu! It's Kazu from Kenshinkan. Currently (as of Oct. 14), we have the directors and other high ranked members visiting from the U.S. I have met them at the Honbu Dojo for the first time. They are so polite! I felt rather embarrassed, yet it was inspiring. The photos below are brought back by Kaicho from his recent training trip with Hanshi to the U.S. and Argentina. This is a photo taken at Colorado Springs Training Camp. 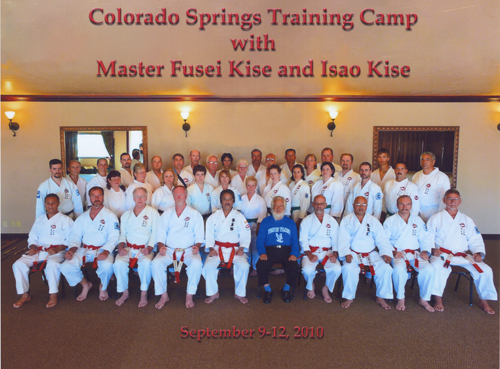 Hanshi looks cool in his blue top and Kaicho is on his left. 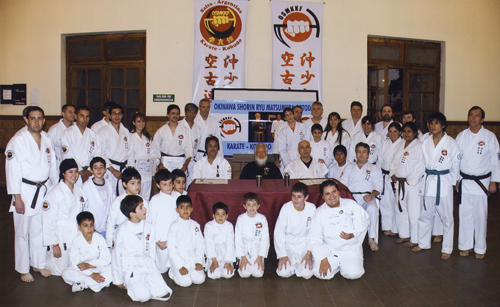 This is a photo from Argentina, everyone looking 'brave', with Hanshi in a black gi and Kaicho on his left. I am hoping to post an article on a visit of overseas members soon. That's all for today. From Kazu with a sore foot.